Peter looks at Simon and says, "You wicked person! May your money be lost with you if you think God's gifts can be bought." N THE CITY of Samaria, about thirty miles north of Jerusalem, lived a man whose name was Simon. For a long time this man had made the people of Samaria believe he was some great person. He would perform cunning tricks before them, which they could not understand. And they thought he had received power from God to do these things. But Simon was a very wicked man, and he had received power from Satan instead of from God. One day a preacher came to Samaria from Jerusalem. This preacher was Philip, one of the seven men whom the multitude had chosen to help care for the poor widows. No longer was he needed in Jerusalem to do this good work, for the multitude of believers were now scattered, and very few remained in Jerusalem with the apostles. After Stephen's death the enemies of Jesus had grown bold and they had tried to destroy the new religion by troubling the believers. Some they had caught and thrown into prisons. Saul, the young Pharisee who stood by watching when Stephen was being stoned, now became one of the bitterest enemies. He went from house to house, searching for men and women who worshiped with the apostles, and when he found them he shut them up in prison. Because of these things the believers no longer met each day to worship in the temple, and many of them left Jerusalem and went to live in other cities. The men and women who fled from Jerusalem did not run away to hide like cowards. They did not feel sad because they were believers in Christ. Everywhere they went they talked to other people about Jesus, and soon the new religion began to spread faster than ever. And so it was that Philip came to preach the gospel in Samaria. The people of Samaria listened closely to Philip's preaching. They had never heard the gospel story before. Now they saw Philip work miracles among them in the name of Jesus, and they wondered at the great power God had given to him. Many of them believed in Jesus when they saw the sick and the lame healed through faith in Jesus' name. And they paid no more heed to Simon, whom they had thought to be a great man before Philip came, for now Philip was doing greater things than Simon had ever done. 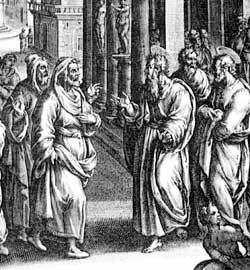 Simon, too, came to hear Philip preach and to see the miracles he performed. He watched this preacher from Jerusalem heal the sick and cast out evil spirits. He saw him cause even the lame to walk. And he knew the power Philip had was greater than his own, so he joined the company of believers in Samaria and was baptized with them. But all the while he had never repented of his sins and wickedness. When the apostles in Jerusalem heard that Philip's preaching in Samaria had caused many people to accept Jesus as the Savior, they sent Peter and John to visit them. And these two men came to tell them more about the power of God, for as yet none of the Samaritans had received the Holy Spirit. When Peter and John prayed for them and laid their hands on them, God gave the Holy Spirit to the Samaritan believers too. Simon looked on with increasing wonder when he saw how Peter and John prayed and laid their hands on these people who received for Holy Spirit. He thought in his heart, "If only I had such power I might again seem to be a great man among these people. Perhaps I can persuade these visitors from Jerusalem to sell this power to me." So he came to the apostles, saying, "I will give you money if you will sell me this power to lay my hands on whomever I please that they may receive the Holy Spirit." But Peter looked at Simon and said, "You wicked person! May your money be lost with you if you think God's gifts can be bought. You do not have any part in this work, for your heart is not right in God's sight. Unless you repent of your sins and pray God to forgive your wicked thoughts you will be lost, for now you are bound fast with sin as with a chain." Simon was frightened when he heard Peter's words. Even yet he did not understand, for he did not know how God could make his heart right. So he asked Peter to pray for him, that he might not be lost. But we do not know that he ever repented of his sins and turned to God. After their visit in Samaria, Peter and John returned again to Jerusalem, passing through other villages along the way and preaching the gospel to all who would listen. And all the while more believers were being added to God's church; for wherever people believed in Jesus as their Savior from sin they became members of the church of God.